"It came to the earth from lead-grey Yuggoth, where the cities are under the warm deep sea." - H.P. Lovecraft, "The Horror in the Museum"
"The sun shines there no brighter than a star, but the beings need no light. They have other, subtler senses, and put no windows in their great houses and temples." - H.P. Lovecraft, "The Whisperer in Darkness"
It's not often that science gives us a glimpse of a world no human has ever seen before. 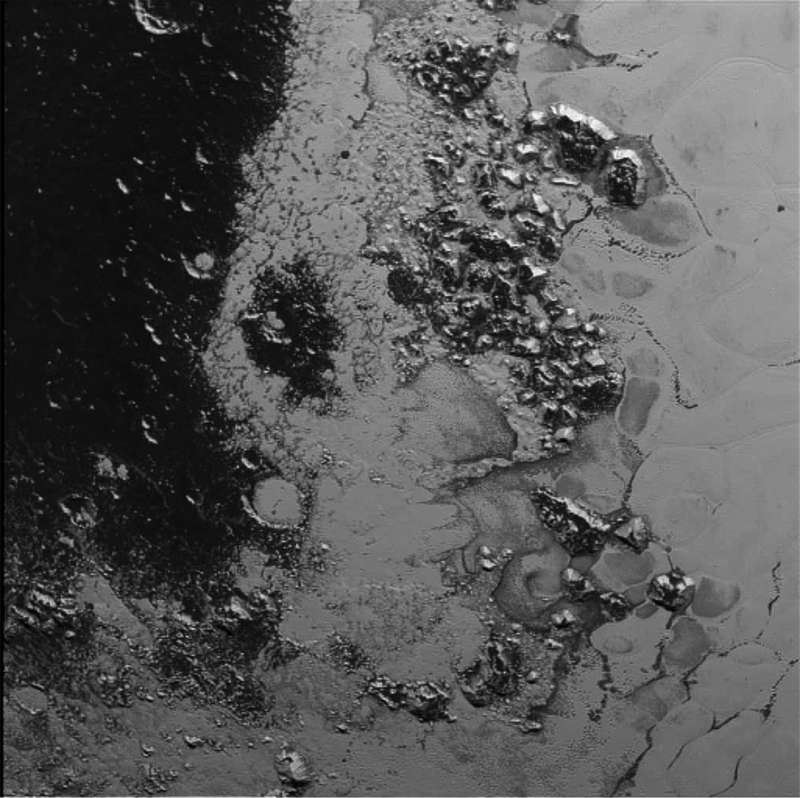 Look at the grey landscape and the black seas, and the icy mountains of Pluto, and tell me with a straight face that it's not a game setting. What lurks in those craggy mountains? Do windowless cyclopean towers lie beneath the forbidding black seas? 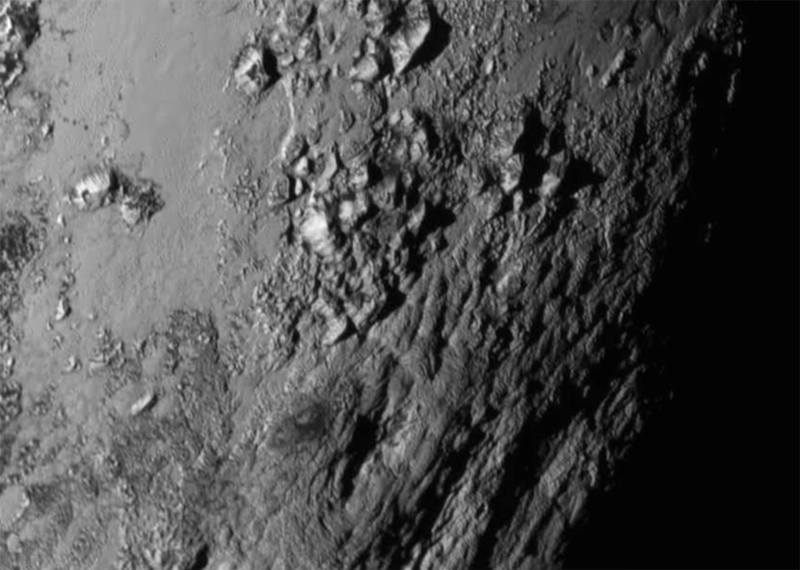 What could live on this cold dark world that Lovecraft dubbed Yuggoth? NASA photographs are not subject to copyright. 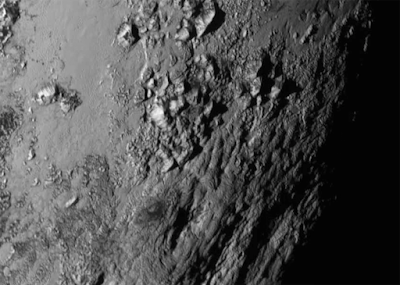 All images from the New Horizons mission are available here. Photographs are used for entertainment purposes only and should not be construed as an endorsement of this site or its contents by NASA. I got to run a hangout game of OD&D with Greyhawk last night, and the above was the list of books I used in prep and while running the game (less the Arduin Grimoire which I wound up using because it was handy). I'm actually lookng at finally writing the module I've been meaning to write and wanted to run some players through the dungeon; it was successful. I have to give a positive mention to Geoffrey McKinney's Carcosa; I used his "Spawn of Shub-Niggurath" generator to get inspiration for one of the monsters, which helped add to the high weirdness quotient of the game. I also reskinned a wand as a ray-gun, which went over very well. The dungeon itself is supposed to have an "ancient ruins invaded by some science fiction stuff" feel, so that was all very much to the good. The one thing that really stood out to me in the game was the effect of movement rates in combat. It's a very static thing, where a high movement rate more or less always wins. The PCs, not yet being burdened with encumbering treasure, were able to chase down fleeing goblins so handily that they could have overtaken them if they liked. Later when they chose to run from a large number of goblins they had no problem doing so. Likewise, when they got back to the surface they found that they could not run from the velociraptor whose interest they drew. (Velociraptors in my games are basically colorful, predatory turkey-vultures that primarily stay on the ground and have nasty sharp claws.) Giving velociraptors a movement rate of 18" (180/60 in B/X terms) means that the PCs could not even conceivably flee and had to stand and fight. This led to the near-death of the hobbit thief, who took a raptor claw to the face. This aspect of the game is really important when you play it as generally intended, with monsters regularly breaking morale (like the goblins in my game) and running, and yet it isn't – to my knowledge – covered in any of the various rule sets and revisions out there with anything more sophisticated than the OD&D movement rate system. At best, initiative can get you a head start, but that's about it. OD&D with Greyhawk has some pretty severe organizational issues, but overall it's such a favorite of mine that I couldn't permanently get away from it. Getting a chance to run it on hangouts is a real pleasure. If you don't have the real thing, I'd recommend giving Iron Falcon a shot. I don't use it because I prefer making my own inferences and rulings from the OD&D booklets, but more than any other clone it gets the rules I prefer to use out.